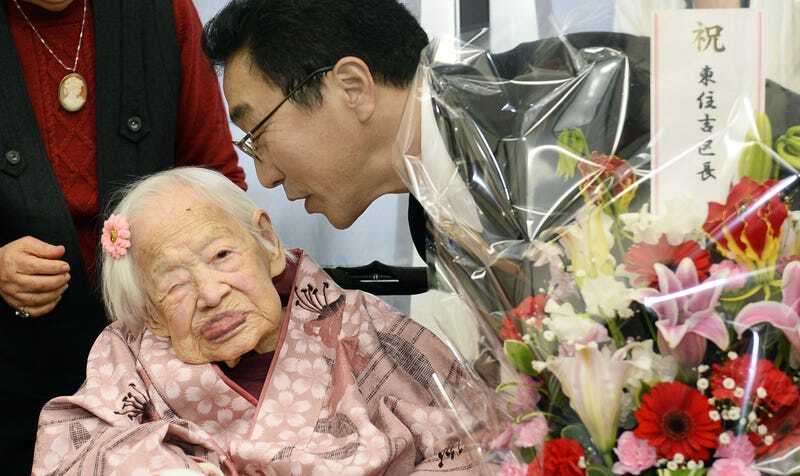 Misao Okawa just became the world's oldest person, punching in her time card on Earth at 117 years. This woman is one hundred and seventeen years old and I'm sitting over here clocking in at twenty-six and I'm already exhausted. Okawa was born in Osaka, Japan on March 3rd, 1898. In 2013, Guinness World Record recognized her as the world's oldest person and homegirl hasn't given up that title yet. The AP reports that, when asked for the secret behind her long life, Okawa said: "I wonder about that too." She also said that 117 years "seemed rather short." I don't know Okawa personally, but in my scientific opinion, her longevity and good health can primarily be attributed to the fact that she probably doesn't drink milk and never lets the haters keep her down. Okawa and her husband Yukio married in 1919, and he died in 1931. She has three children, four grandchildren and six great-grandchildren. This is a picture of Okawa last year on her 116th birthday looking as fly as ever.